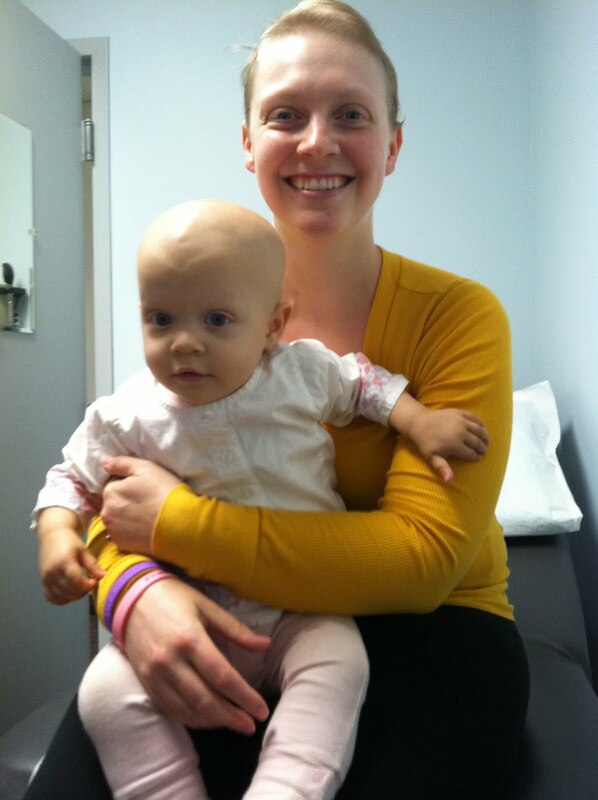 New Mom ..... New Cancer: If it's not one thing, it's another. So I'm feeling better, and things are looking up on my end, so of course I'm hoping for a break in the craziness. But no, the baby had to create all sorts of craziness all on her own. On Monday she woke up with two unexplained black eyes. After deciding to scare us by throwing up, we were told by the pediatrician to go to the ER. Now, first off, my blood counts are low and I'm not supposed to go to the grocery store, let alone the ER. But we all went, waited for an hour, waited again, and then were told that she's fine and maybe she has allergies. (She's cutting her two front top teeth by the way, and is not sleeping too well.) So the next day, she was still cranky and still had those black eyes, so I made an afternoon appointment with the Pedi. Mike took her in, as I still am not supposed to be exposing myself to anything (let alone an office full of sick kids during school vacation week). Mike called me about 45 minutes later and told me that they were transferring her by ambulance to Children's Hospital in Boston. What? I thought she had allergies! So, now I've called my parents to come drive me to Boston, where I found a pretty happy baby (considering) and not a whole lot of answers. We ended up there until midnight just to find out she has a minor virus or something, and is teething. I'm pretty sure we didn't need an ER to tell us that, but at least they did real tests. So for the rest of the week, I've had a sleepy, sore, cranky baby with no appetite, who is now refusing to drink milk or eat anything green. So much for working to change her over to milk this week. So now I'm exhausted, and just hoping that she feels better by Monday. I'm going to need to get out of the house next week, and she just hasn't really been letting me. At least she's healthy, and she seems to be doing better each day. Now if those teeth would just come through we'd be all set!